From auditions to strike, and more! Have you ever wanted to know more about what goes on backstage? What exactly a stage manager does? Why theater folks say "break a leg"? 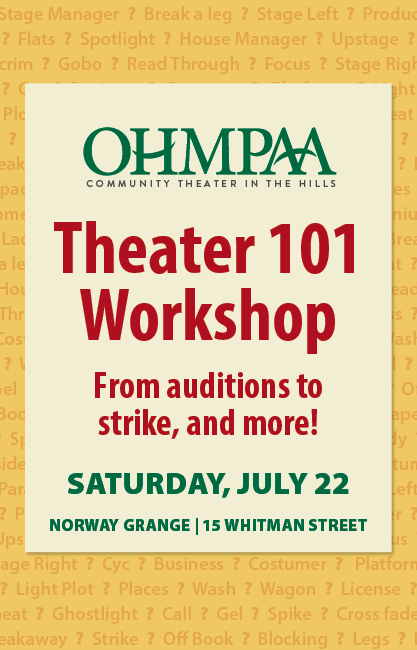 This FREE workshop is for you! Join us for a morning at the Grange and hear about what goes into taking a show from auditions to strike, and more. You'll take a behind-the-scenes tour of our stage and dressing room, meet show producers, ask questions, play stress-free theater games, and enjoy refreshments! Pre-registration is helpful, but not required.